Man Utd boss Jose Mourinho has confirmed that Romelu Lukaku will miss the Juventus game through injury, and could be absent at the weekend against Man City. The 25-year-old has struggled to find his best form so far this season, scoring just four goals in 14 appearances with his last goal coming way back on September 15. After initially sitting on the bench for the win over Everton, an injury ruled him out against Bournemouth at the weekend and it appears as though that issue is still troubling him, as per the tweet from The Independent’s Miguel Delaney below. 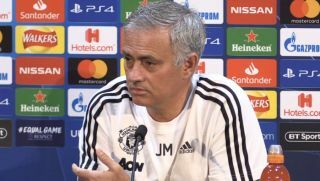 Given United have coped pretty well without him with the likes of Alexis Sanchez, Marcus Rashford and particularly Anthony Martial stepping up and delivering, it may not feel like such a heavy blow for Mourinho and the Red Devils. Nevertheless, Lukaku’s physicality and ability to offer a different dynamic up front might have been key for Man Utd at the weekend and in Turin, and so Mourinho will surely be disappointed to see him miss out. There is still hope for Sunday as the Portuguese tactician suggested that he ‘didn’t know’ if he’d recover in time, and so time will tell if United get a positive update on his recovery in the coming days. What is certain though is that the Belgian international will play no part against Juventus as United look to bounce back from their defeat to the Italian champions last time out in Europe.